My friend Alan had heard “on the power station grapevine” that the Grain Power Station chimney was due to be demolished at 11:00 today. He told me about a week ago but I was scheduled to be working. Luckily work was cancelled and I was able to go, but unfortunately (for me) Al had luckily got a privilege pass to see it from on site. I decided to ride there alone – I’ve always wanted to see a huge structure ‘blown-up’ and here was the ideal chance. 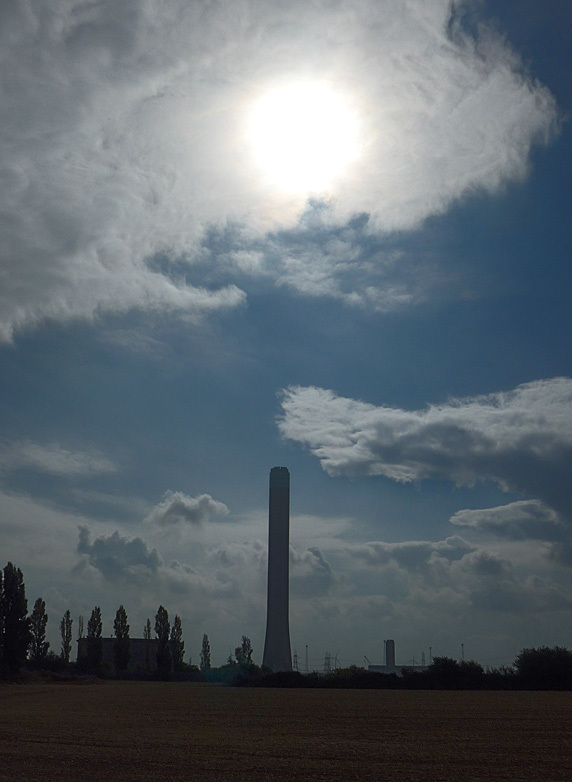 The chimney, at 800 feet high, would be the tallest structure ever to be demolished in the UK. I planned a no-frills route to ride there as quickly as possible so I used quite a few main roads. I used Google Earth and Street View to find a spot with a good view of the tower. The morning was warm at 21°C at 8:30 am. But it was very misty. I was hoping that wouldn’t affect the view. My route took me through Aylesford, up Bluebell Hill, down to Rochester, over the bridge and onto the Hoo Peninsular. A couple of miles onto the peninsular I saw the chimney to my right. It was fatter than in pictures I had seen, and I thought it was weird that it was to my right. Maybe the road curved round behind it, I reasoned. At this point I thought I might be running late and had no idea what the time was. So I kept my eyes on it in case it suddenly blew up! Looking at my Garmin I saw that I still had miles to go. I pushed on. 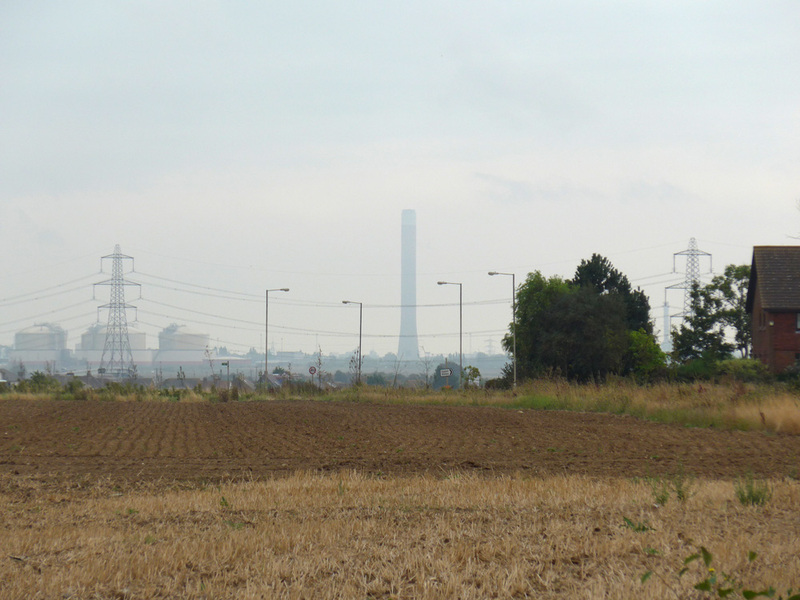 Then, as I rounded a bend, way off in the distance on the horizon I saw the correct chimney. I had been looking at the wrong one! The one in the distance was tall and skinny, just as I had seen before, and barely visible through the mist. Now that I was sure it was the right one, I realised that I still had quite a way to go. In fact it turned out to be another seven miles. With the chimney stuck firmly in my sights, I rode faster, not knowing what the time was. I had half-expected road closures or at least something warning of the impending epic event, but I saw not a single clue. Over to the right of me I could see that the clouds were breaking up a bit, suggesting that the mist might yet clear before the big moment. As I got nearer I began to see signs of activity. 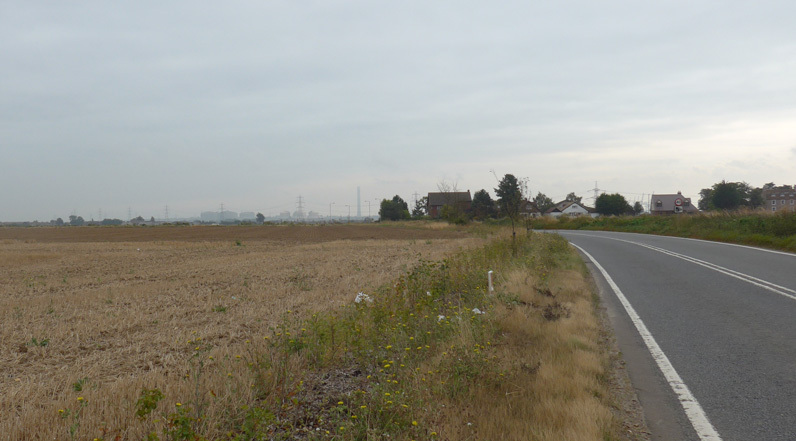 Groups of people walking in the fields; cars parked by the side of the road. It felt a bit like that scene in Close Encounters where people are making a pilgrimage towards that hill. I wondered if my way would soon be blocked by army vehicles and barbed-wire fences! I sped on, worried I was running late. Then I saw a guy setting up a tripod and camera with a huge telephoto lens attached. He didn’t seem in a hurry, so I assumed I still had a bit of time to spare. Still the chimney was quite far off. I passed more evidence of on-lookers. Eventually I reached the place I had planned for. There was a small lay-by to the left of the road that offered a clear view of the tower right down to its base. A small crowd had gathered. As soon as I stopped, I checked the time – 10:31 – I had almost half an hour to spare! All that rushing was needless. I now had enough time to make sure I knew how to take a video on my camera – it took me quite a while to find the right button! People’s conversation was centred around which way it would fall, with some saying that it would just come straight down. By now the mist had cleared completely and the sun came out. At T-minus ten minutes a siren sounded. 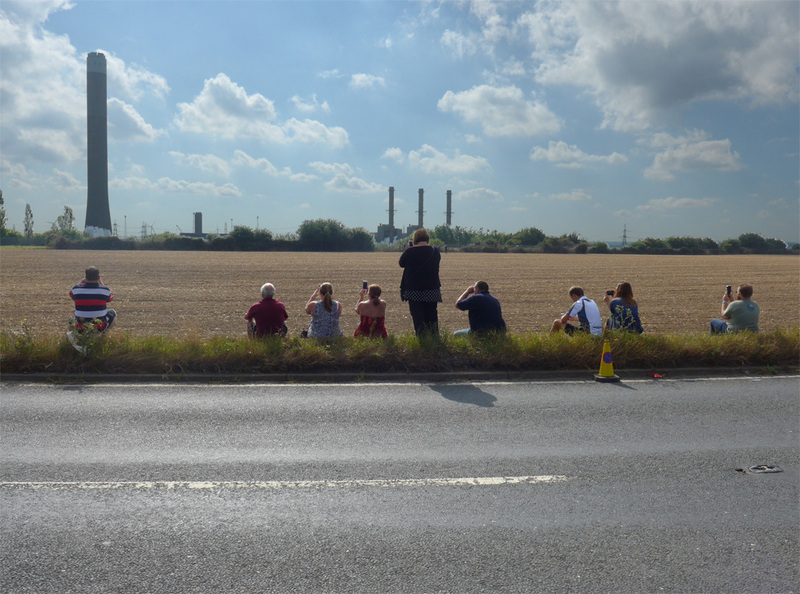 This prompted some of the onlookers to cross the road to the field opposite. I was tempted but stayed where I was. It had seemed as if the tower had been just a couple of hundred metres in front of us. But that was an illusion caused by the sheer size of the chimney. In the video you can hear the delay between what you see and what you hear. First there was a silent puff of smoke halfway up the stack, followed a second or so later by the crack of the explosion that had caused it. Then there was some other noise, immediately followed by a huge but very short thud of the main explosion. This came midway through the tower collapsing such was the extent of the visuals and audio being ‘out of sync’. The sound was massive and could be felt more than heard. The whole ground shook. This was far more powerful than the loudest of fireworks. There was no way the video was going to be able to capture the power of it. As I stood there watching it collapse, a huge wave of emotion came over me and I couldn’t help but involuntarily smile at the sheer awesomeness of it! Approximately eight seconds after the initial explosion, the great chimney was no more. 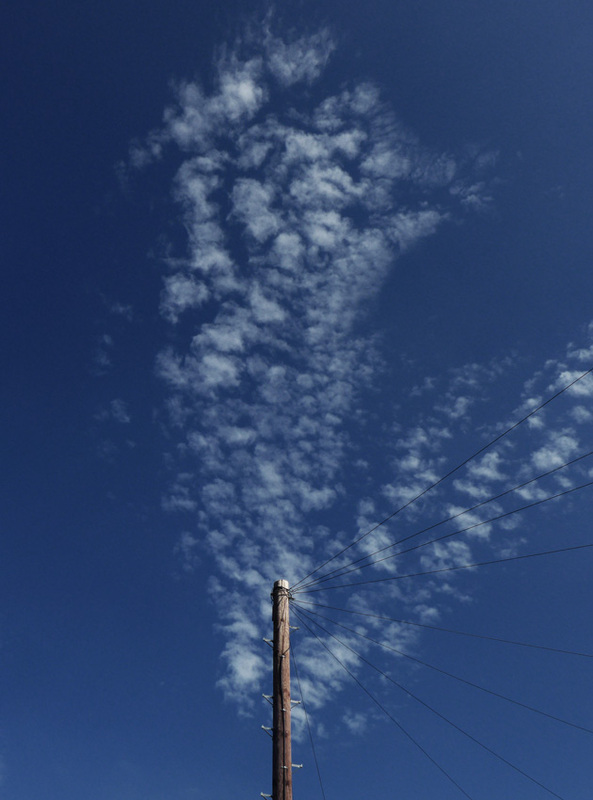 It was replaced by a huge dust cloud, which slowly drifted to the right, in the direction I would be cycling home. I started riding back. I could see that the dust cloud had already cleared ‘ground zero’ and was moving towards Gravesend. I looked back at where the chimney had been and noticed that you could now clearly see what remained of the base, so I stopped for one last photo. Although not beautiful by most conventional definitions, the chimney had at least been magnificent. 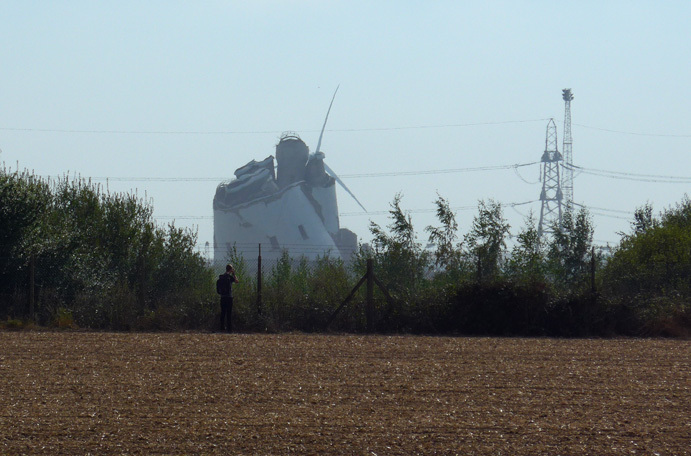 For 37 years it had stood, lording it over the surrounding landscape. It seemed somewhat ignominious for it to be brought down in just eight seconds! The ride home was in beautiful sunshine. 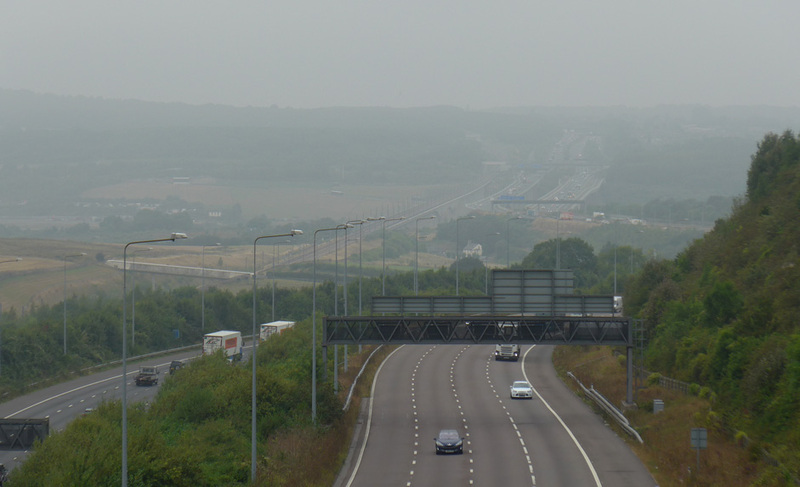 As I left the Hoo peninsular I could still see the dust cloud way off in the distance over to my right. I stopped briefly in a park in Rochester before riding home using the exact same route back. 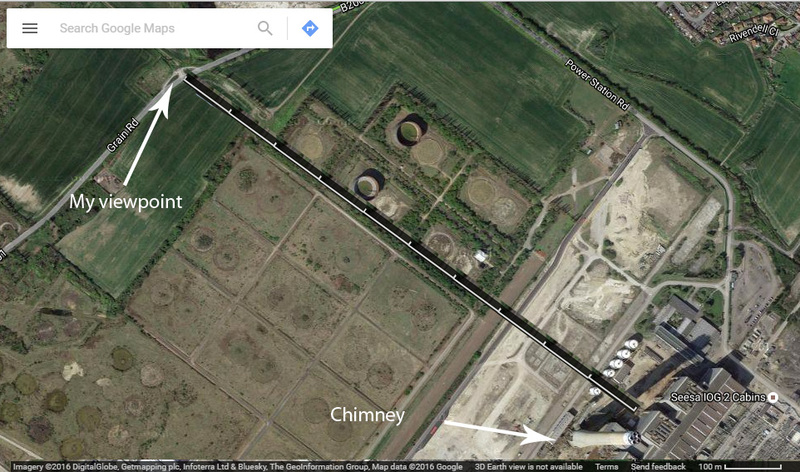 When I got home I used Google Satellite view to calculate roughly how far I had been from the chimney. I photoshopped the scale marker from the bottom right and managed to fit it on 10 times, indicating 10 x 100m or 1km. So I had been one kilometre from the chimney and it had still looked huge even from that distance! Fascinating……and, there it was – gone- in huge puff of smoke…..
Great idea to go and see it. It’s not often you get to feel the ground shake beneath you. I like the idea of all the people gathering like a scene from close encounters. I would have thought a rare bird had landed somewhere close by if I had been passing. Great film of the chimney being blown up. Would like to have been there myself!!! Did almost the exact same thing myself. Cycled to Queenborough via Hollingbourne Hill from Coxheath. Got there 10 minutes before the planned demolition time, but actually missed the initial explosives going off. I turned around and the chimney was already half way down. Stopped off at Bredgar Farm Shop on the way home and had a truly massive fry up! Hey Jimmy, thanks for your comment – I probably saw you there – I did briefly chat with one guy. 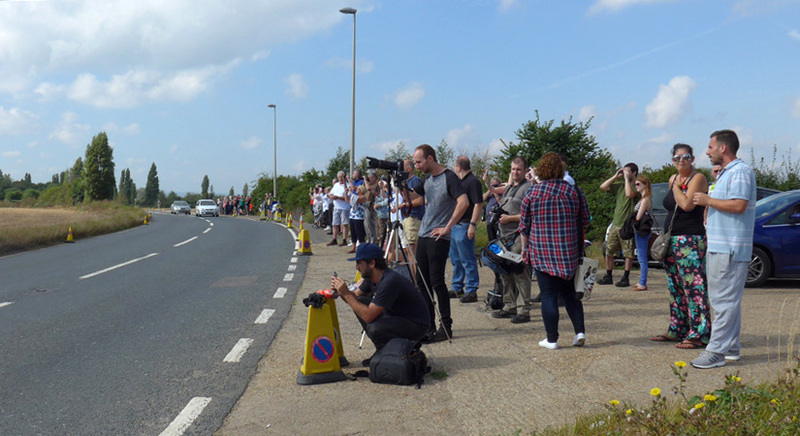 Such a shame that you missed the start – I had my eyes glued! Bredgar Farm Shop sounds good – I’ll have to check it out! Cheers!